Despite the weather, it was a great days walking in the Brecon Beacons. 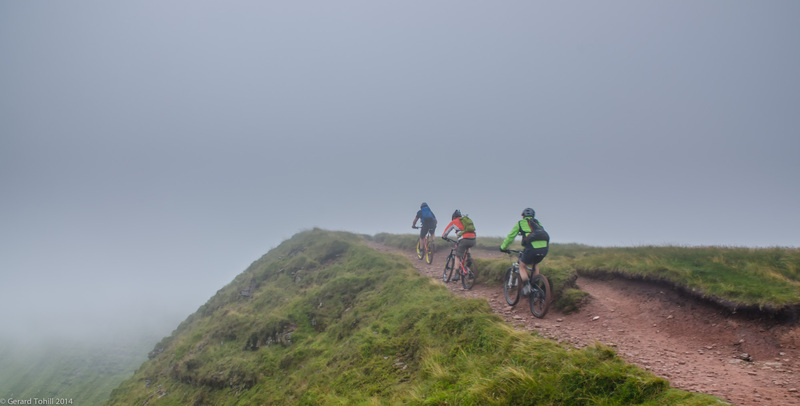 Certainly not a day for photography – full wet weather gear was required for the better part of the day, but I did meet these three mountain bikers, fresh from their struggle up the steep climb from Bwlch ar y Fan towards the unnamed height near Gwaun Cerrig Llwydion. They quickly disappeared into the mist, and I never saw them again! Photography stuff: 18-70mm lens at 18mm, 1/25 sec at f/11, handheld. It was a spur of the moment shot, so I had to go with the settings I had – if I had been more prepared, I’d have widened the aperture to give a faster shutter speed of at least 1/50 sec. The cyclists disappeared into the mist in a matter of seconds – I didn’t have time to change anything. C’est la vie!